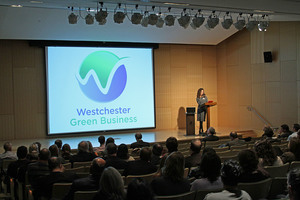 Dr. Marsha Gordon, President and CEO of the Business Council of Westchester, announced the expansion of the Westchester Green Business (WGB) program in New York State. 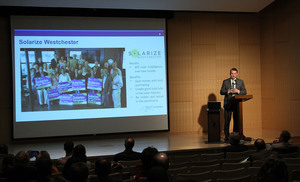 Westchester Green Business was awarded funding through The Cleaner, Greener Communities initiative (CGC), a statewide program, to incorporate sustainability goals and principles into local decision-making, and leading to a reduction of greenhouse gas emissions and the generation of economic benefits. 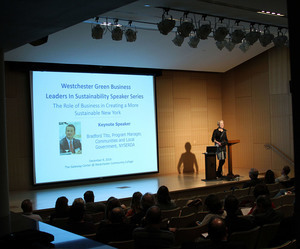 The announcement was made at the quarterly Westchester Green Business Leaders in Sustainability Speaker Series held at Westchester Community College. Representatives from the Business Council of Westchester (BCW), Westchester County, Westchester Green Business (WGB) and the New York State Energy Research and Development Authority (NYSERDA) met to explore the role of business in achieving New York State’s energy goals. 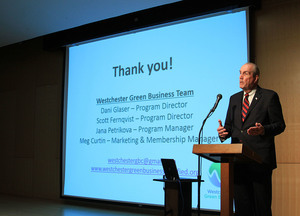 The Westchester Green Business program is the region’s only green business certification program and currently has 71 member businesses and organizations of various sizes in a cross section of industries. The program began in 2009 as a partnership between The Business Council of Westchester and Westchester County. Westchester Green Business​ is a Business Council of Westchester program administered in partnership with Westchester County since 2009. The program provides businesses with a turnkey system to successfully integrate sustainable business practices into company operations. Business professionals learn exactly where resources are being wasted and identify opportunities to increase efficiency and save money. Proprietary performance tools are used to calculate the economic and environmental impacts of energy, travel, waste, water and refrigerants in an organization, while staff surveys gauge behavioral impacts. Westchester Green Business participants are recognized as green business leaders across diverse industry sectors. The county’s largest and most influential business membership organization, The Business Council of Westchester is committed to helping businesses build, connect and win. 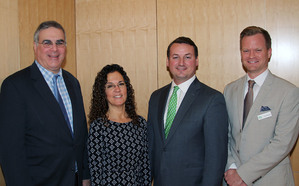 In addition, The Business Council of Westchester is actively involved in reviewing federal, state and county legislation and regulations in order to assess the potential impact on the business community and to influence the outcomes through advocacy when the business community’s interests may be affected. It also acts as an information resource for the business community and government leaders at all levels.